15 COB Technology LED Black BBQ lights. 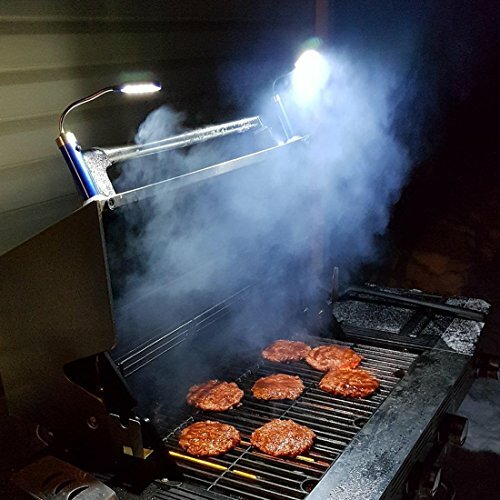 Bring light where you need it during late night grilling with the adjustable led barbeque grill light by LILUOE. 15 super bright led lights illuminate your grill surface so you can grill anytime. Mount the clip base with magnet anywhere and adjust the light exactly where you want it with the 15-inch flexible neck keeping your hands free for utensils and frosty beverage. [360 DEGREE BEND]-Rugged 360 Degree Rotating Rubber Mount with Universal Attachment Straps That Won't Melt Like Comparable Plastic Lights. [15 SUPER BRIGHT LED LIGHTS] - Now, at last, you can grill after dark without the hassles and dangers of holding a flashlight in one hand! [6* 'AAA' ALKALINE BATTERIES INCLUDED] - Is there anything worse than getting a great new tool and having to dig through every drawer in the house trying to find batteries? Your All Purpose BBQ Light includes 6* 'AAA' batteries so you can use it straight out of the box! If you have any questions about this product by LILUOE, contact us by completing and submitting the form below. If you are looking for a specif part number, please include it with your message.